The Doak House Museum will offer a workshop in September to teach the beautiful fiber art process of batik. The workshop will teach the basics of batik for beginners. Part one of the workshop will be Friday, Sept. 9, from 3-6 p.m., the second half of the class will be Saturday, Sept. 10, from 10 a.m. to 2 p.m. This unique fabric dyeing and decorating technique uses beeswax and cold-water dye to produce beautiful results on natural fabrics like cotton and silk. The cost is $45 per person and all materials are provided. Space is limited, registration and deposit are required. Contact Boyd at 423-636-8554 or dboyd@tusculum.edu for more information or to pre-register. A deposit is due by August 31. Dr. Fran Church will be the instructor for the workshop. The President Andrew Johnson Museum and Library at Tusculum College has received an $800 grant from the Tennessee Historical Records Advisory Board to purchase shelving to improve the storage for its historic collections. The Tennessee Historical Records Advisory Board received $27,500 from the National Historical Publications and Records Commission to assist Tennessee’s historic record centers through a grant program called State and National Archival Partnership. SNAP Grants are available up to $2,500. The SNAP grants are open to any Tennessee organization with historical records that are available to the public. The SNAP grants provide training and supplies for the preservation, improving access and enhancing historic record programs. Through this grant, the museum will be purchasing new shelves for its archival collections. According to Kathy Cuff, archivist at the President Andrew Johnson Museum and Library, the new shelves will provide proper storage for the Rare Books Collection and the backlog of other collections. “This will relieve the crowding seen in the Rare Books Collection, which contains one of the most complete libraries from a post-Revolutionary frontier college,” she said. Cuff added that the shelving will also be used to improve access to backlogged collections. The backlog shelving will remove the possibility of crushing collections through stacking boxes on top of each other. The President Andrew Johnson Museum and Library collects, preserves and makes available the records of Tennessee’s first college. The museum is open to the public Monday through Friday, from 9 a.m. to 5 p.m. For information about Tusculum College’s historic collections, contact Cuff at kcuff@tusculum.edu or at 423-636-7348. The President Andrew Johnson Museum and Library and the Doak House Museum are operated by the Department of Museum Program and Studies of Tusculum College. In addition to the museums, the department is responsible for the College Archives and offers one of the few undergraduate Museum Studies degree programs in the country. The two museums are also part of the National Historic District on the Tusculum College campus. Follow the museums on Facebook and Twitter to learn the latest news and upcoming events or visit www.tusculum.edu/museums to learn more about the variety of programs offered at the museums. The Doak House Museum is offering a history camp option in June for youngsters who want to attend fun, educational activities over the summer but may not be able to commit to a week-long camp. The “Drop-in History Camp” is scheduled for June 8 -12 and will offer participants an opportunity to enjoy fun, educational and interactive games and activities each day. The camp is designed for children ages six through 12 years of age. Each day will offer a different focus for activities. On Monday, June 8, the focus will be on cooking and crafts as participants will make baked apples, churn butter, create recycled planters and practice the art of tin punching. Activities on Tuesday, June 9, will provide youngsters a glimpse of what school was like for their counterparts in the 19th century. They will be making their own paper, creating a marbled paper journal and writing a story using a quill pen. Every day life in the 1800s will be explored on Wednesday, June 10, as participants will dip their own candlesticks, craft a candlestick holder, make corn husk dolls, piece together a paper quilt and play 19th century games. On Thursday, June 11, participants will get creative as they put on a shadow puppet play, learn the art of decoupage, cut out silhouettes and make holiday ornaments. The camp will conclude with a day of fun and games on Friday, June 12. Participants will make a mop horse and then use their creations in a mop horse race. They will go on a marble hunt and learn to shoot marbles with their finds. Youngsters will make their own checkerboards and play jackstraws. The camp will be led by Kim Crowell, who is a second-year student in the University of Florida’s Museum Studies Master’s program. Her disciplinary focus is in education. Crowell earned bachelor of fine arts degree in fine art with a minor in business from Columbus State University. Parents are asked to drop off their children at the museum between 9:30 and 10 a.m. on camp days and pick them up by 3 p.m. The fee is $15 per day and no sign-up, deposit or reservations are required. A snack will be provided but participants will need to bring their own lunch. For more information contact the Doak House at 423-636-8554 or email kcrowell@tusculum.edu. History Camp will be held June 8-12 and Art Camp will be held July 13-17. The camps are designed for children ages 6-12. In History Camp, children will explore the Tusculum College campus and the Doak House Museum site through a variety of interactive games, crafts and activities. The camp will feature a new instructor with all new activities and curriculum. Art camp will be a mixture of sculpture, drawing, color mixing and other fun activities. Campers can let their imaginations run wild and make fantastical figures out of paper mache or draw from nature at the beautiful five-acre Doak House site. Tuition for each camp is $85 with all materials and a daily snack included. Camp hours are 9:30 a.m. to 3 p.m. daily. Sibling and Tusculum College employee discounts are available. A deposit and registration are required. Reserve a spot by Friday, May 15, and receive the special discount rate of $75. “We pride ourselves on having fun, engaging, affordable camps for the families in our community,” said Dollie Boyd, director of Museum Program and Studies at Tusculum College. Space is limited. For more information, contact Boyd at dboyd@tusculum.edu or by phone at 423-636-8554. The Tennessee Civil War National Heritage Area has expanded its traveling exhibition, “Free at Last!” to include the President Andrew Johnson Museum and Library at Tusculum College. The exhibit expansion comes with the concluding year of the multi-year celebration of the 150th anniversary of the Civil War. “Free at Last!” tells the story of the transition from slavery to freedom and the development of citizenship among formerly enslaved African-Americans. Doubled in size to eight banner stands, the exhibition now has panels focused on each of Tennessee’s three grand divisions. “Free at Last!” will be on view at the President Andrew Johnson Museum and Library on the Tusculum College campus from May 4 to June 30. More than 40 venues across Tennessee have hosted “Free at Last!” Sites will now have the opportunity to share even more of the story with visitors. New panels on East Tennessee look at that region’s legacy of emancipation before the Civil War and consider how emancipation has been remembered in the region since the war. The Heritage Area has also published a driving tour of Reconstruction sites across the state. “The driving tour goes hand in hand with the expanded exhibition to provide Tennessee residents and visitors with in-depth knowledge about this significant and often misunderstood period in Tennessee’s history,” says Leigh Ann Gardner, interpretive specialist for the Heritage Area. For more information, please contact Boyd at 423-636-8554 or dboyd@tusculum.edu. The Tennessee Civil War National Heritage Area receives funding from the National Park Service and is administered by the Center for Historic Preservation at Middle Tennessee State University. For more information about the exhibition, please contact Antoinette van Zelm at (615) 494-8869. The Old Oak Festival will feature a variety of craft vendors along with musical entertainment, theater, art exhibits, poetry readings and activities for children of all ages. The Old Oak Festival is returning to the Tusculum College campus April 17-19. The arts and music festival will span across three days and will feature something for everyone, including crafts, music, art, theater, storytelling and area authors, as well as gallery and museum exhibits. In addition to artist vendors and music performances throughout the day on Friday and Saturday, there will be three performances during the festival of “5X10,” presented by Tusculum students under the direction of Wayne Thomas, the interim dean of the arts and sciences, Frank Mengel, arts outreach technical director and instructor, and Brian Ricker, arts outreach and assistant. Performances will be held in the Behan Arena Theatre in the Annie Hogan Byrd Fine Arts Center. Show times are Friday and Saturday at 7 p.m. and Sunday at 2 p.m. The college’s Allison Gallery will be open throughout the weekend, featuring a faculty and family spotlight exhibition by Deborah Bryan. The festival is being coordinated by a committee of college and community representatives who are working to promote arts and music in the East Tennessee region. “We are expecting a wide variety of artists, including painters, craftsmen and sculptors, whose work will be available for purchase. Arts will include pottery, woodcrafts and folk art,” said Price. Demonstrations will also be conducted on pottery, blacksmithing and cooking. There are limited spaces still available for artisan and crafter booths. Deadline for reserving a booth is April 8, 2015, or until all spaces are filled. Throughout the weekend on stage, the festival will present the sounds of the region, with a wide variety of music from bluegrass to jazz to local vocalists and musicians. Both the President Andrew Johnson Museum and Library and the Doak House Museum will be open to visitors during the festival and will have special activities planned for adults and children from 9 a.m. to 5 p.m. on Friday, 10 a.m. to 4 p.m. on Saturday and 1-4 p.m. on Sunday. The Doak House Museum will sponsor a batik workshop during the three days of the festival. Participants will learn how to make stunning designs on natural fiber cloth using the wax-resist dyeing method. Reservations and advance deposits are required. The workshop will be held in the heart of the festival on the main campus. Reservation and deposit are required. Contact Leah Walker at 423-636-8554 or lwalker@tusculum.edu for reservations and more information. Fiddlin’ Carson Peter’s Band and the Old Time Travelers, a duo from Chattanooga Tennessee, will perform on the Doak House lawn on the Saturday of the festival. Picnic tables are available to the public to bring a lunch, tour the museum and hear great bluegrass and old-time music. Performance times will be announced at a later date. 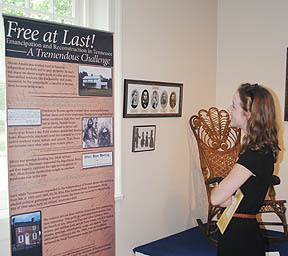 For the length of the festival only, the museum will open its collections storage to display never before exhibited Appalachian chairs and other furnishings, titled “Sittin’ Pretty: Selections from the Doak House Furniture Collection.” Admission is free and donations are appreciated. The President Andrew Johnson Museum and Library will sponsor a 19th Century Toys and Games booth in the children’s area. Come and play with traditional folk toys and make-and-take your very own toy as a souvenir. The festival will feature children’s activities on Saturday from 9 a.m. to 5 p.m. and again on Sunday from noon to 5 p.m. There will be storytelling performances on stage and around the festival grounds. The Walnut Ridge llamas, previous favorites of the festival, will visit the Tusculum College campus over the weekend. Throughout the weekend, there will be everything from bed racing to surprise performances to craft workshops. Food selection will include festival favorites, such as homemade strawberry shortcake, Philly cheese steak, and Mennonite doughnuts. Music and food will be available until 9 p.m. on Friday and Saturday and until 4 p.m. on Sunday. There is no fee to attend the festival. Art vendor hours will be Friday from noon until 6 p.m., Saturday from 9 a.m. until 6 p.m. and Sunday from 10 a.m. until 4 p.m. For more information, contact Price at 423-636-7303. Coolers and alcohol are prohibited during the festival. For updates and more information, visit the website at www.oldoakfestival.org or on Facebook at www.facebook/OldOakFestival. Bragging time! We won two awards at the recent Tennessee Association of Museums Conference held in Jackson. We are particularly proud of the Award of Excellence our students won for their exhibit Reaper: Nettie Fowler McCormick and the Machine that Built Tusculum College. Our undergraduate students were competing against professionals! WAY TO GO!! Experience a Victorian Valentine’s Day at the Doak House Museum as it hosts a “Mad Hatter’s Tea Party” on Saturday, Feb. 14. The museum on the Tusculum College campus will be decorated for a Victorian Valentine’s Day and will be opening its doors for a “mad hat” tea party from 10 a.m. to noon. Participants will enjoy delicious tea and cookies on decorative china and get to try on some of beautiful and whimsically fun hats. Participants can also bring their own fun hats to the tea party. Photos are encouraged to document all the fun with the hats, special treats and crafts in the museum. The history of exchanging Valentines will be shared and participants will be able to make a special valentine to take home. Admission is $5 per family. Please RSVP by calling 423-636-8554 or emailing lwalker@tusculum.edu. 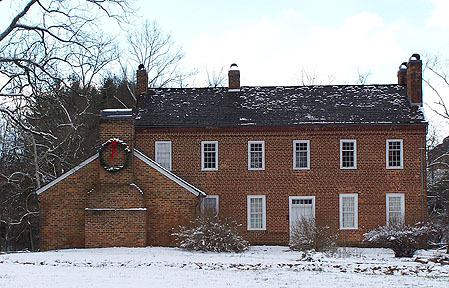 The Doak House Museum is preparing to celebrate the holidays with a Christmas Open House on Dec. 6 and with its popular children’s program, “Storytelling and Gingerbread” through Dec. 18. An open house will be held at the museum on the Tusculum College campus from 10 a.m. to 2 p.m. on Saturday, Dec. 6. Free tours of the museum will be provided along with refreshments, crafts and games for the children, storytelling and specials in the museum’s gift shop with proceeds going toward the museum’s programs. A storyteller will perform at 11 a.m. and 1 p.m. and tours will offered throughout the event. The museum, which is the 1830s home of Tusculum College co-founder the Rev. Samuel Witherspoon Doak, will be decorated in a charming 19th century style, as a home would be during that time period. “Storytelling and Gingerbread,” the Doak House Museum’s most popular children’s program, will be continuing through Dec. 18. Molly Mouse is the guide for the children as they experience holiday customs that the Doak family enjoyed in the 19th century. They learn about holiday foods from the period, gift giving and decorating customs as people lived them 200 years ago. The program is open to public and private school groups as well as home schooled children. The museum is also able to offer Title I schools a discounted admission. On Friday, Dec. 12, the program will be offered for home school children. One adult per family will be admitted free of charge. The program will begin at 1:30 p.m.
For more information about the Open House, contact Leah Walker at the museum at 423-636-8554 or lwalker@tusculum.edu. To make a reservation for the “Storytelling and Gingerbread” program, please contact Dollie Boyd at 423-636-8554 or dboyd@tusculum.edu.